Risk is primarily the probability of a bad event happening or a good event not happening. 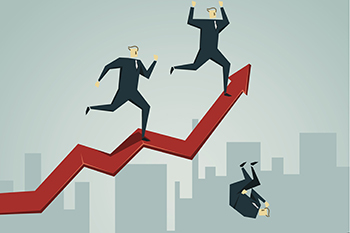 Thus, risk to an investor in the financial market context refers to the possibility of him/her experiencing losses owing to factors that affect the overall performance of the markets in which he/she is engaged. When you invest in any asset class (equity or debt), there is an element of risk. What do we understand by risk? Pose this question to any market player, and the typical answer would be that risk is volatility. There is a subtle difference here. Volatility is not risk; it is the manifestation of risk. When a stock or a bond becomes more risky, it becomes more volatile. Yet, this still does not define risk. Risk is the probability of a bad event happening or a good event not happening. Thus, risk to an investor in the financial market context refers to the possibility of him/her experiencing losses owing to factors that affect the overall performance of the markets in which he/she is engaged. This implies that risk must be always understood in the context of expectations. Long story short, greater the expectations (of returns), greater the risk; and lower the expectations, lower the risk. 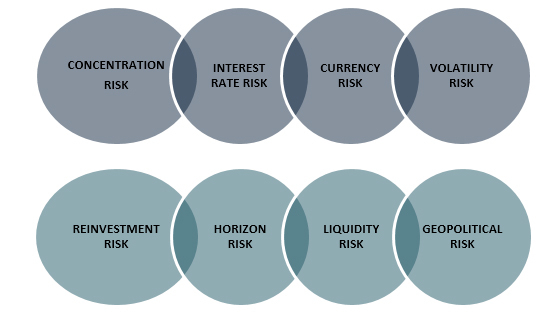 Let us look at 8 specific kinds of market risks and how to handle them. Concentration risk is the risk that you run when you are entirely or substantially invested in one theme or sector. If something goes wrong with the sector, your entire portfolio may go for a toss. The answer to concentration risk is diversification. You don’t have control over how the company performs, but you have control over which stocks/themes you want to be invested in. Interest risk and inflation risk are related because normally higher inflation leads to higher interest rates. This impacts equities and bonds. When rates are cut, bond prices go up, which improves the NAV of bond funds. Even in case of equities, lower rates discount the future cash flows at a lower rate and boosts valuation. The reverse holds when rates rise. If you are invested in bonds, you can shift maturities and if you are in equities, you need to tweak your exposure to rate-sensitive sectors such as banks, NBFCs, auto, and realty. You may wonder why currency risk would impact your rupee portfolio. The problem is that the companies that you invest in are vulnerable to currency risk and that spills over to your returns. For example, IT, pharma, and auto ancillaries are essentially export-oriented and benefit from a strong dollar. Sectors such as capital goods, power, and telecom are importers and benefit from a stronger rupee. When you create your portfolio, keep a mix of dollar defensives and rupee defensives to hedge your risk. The bad news is that whether you are invested in bonds or equities, you cannot escape volatility. The good news is that you can manage volatility by taking a long-term and systematic approach. When you play the market as a short-term trader, volatility hits you really hard. From a long-term perspective, volatility in equities tend to even out over time. Further, a systematic or phased approach helps even out volatility. Liquidity risk arises when you are unable to exit or enter a particular stock within your price range. This problem becomes more profound when the markets become volatile. In a crashing market, liquidity may be hard across all stocks. However, in normal market conditions, you can avoid this risk by sticking to the low impact-cost stocks. This is a risk that has nothing to do with market conditions, but more to do with your own investment decision. IL&FS is today in a crisis because it borrowed short-term money and lent to infrastructure projects. This is the best example of horizon risk on a very large scale. If you invest in equities for a goal that is just three years away, you could very well end up in trouble. The answer lies in structuring your investments as per the horizon of your liabilities. Let us understand this point by comparing a dividend plan and a growth plan of a mutual fund. A dividend plan pays out dividends and unless you reinvest the dividends at the same yield, you are unlikely to create as much wealth in the long run. A growth plan, on the other hand, just keeps reinvesting the returns. Hence, a growth plan does not have reinvestment risk, while any regular payout in the form of interest or dividends carries reinvestment risk. The solution is quite simple. In mutual funds, you can opt for growth plans and in equities, go for low-dividend and high-growth companies. In addition, there is also geopolitical risk, which normally gets factored in volatility risk of a stock or the market. Remember, risks can be many, but a phased, well-informed, and disciplined approach can help you mitigate them to a considerable extent.